Now just a month left in the season and it's as tense as ever. Read all about tonight's matches right here and we'll be back with more live Championship action later this week. At the other end, Bolton are almost down and out. Bristol City and Rotherham share the spoils but MK Dons couldn't capitalise. So, just two points separate the top three after tonight's games. Now just a three-horse race for automatic promotion after Hull's loss at Derby? So that's all the results in on an eventful evening at both ends of the table. A second half turnaround from Reading sees them extend their unbeaten home run to eight games. Oliver Norwood pulled an impressive 30-yard right-foot strike out of his locker for the winner. Fulham hold on to move seven points clear of the drop zone - a significant night in their season as they grab back-to-back wins. Peter Odemwingie's second-half strike gives Bristol City a deserved point against Rotherham. The Robins move seven points clear of the drop, while Neil Warnock's Rotherham are six points above MK Dons in the relegation zone. Seven minutes of injury time have been indicated at Deepdale, yes seven. How nervous are you feeling, Fulham fans? Despite Craig Conway's goal, Blackburn soon crumbled. The Rovers midfielder was sent off minutes after his opener and Adam Henley's own goal. Ross Wallace wrapped up the points for Wednesday as their play-off charge continues. The Dons are in massive trouble, six points adrift of safety with six matches to play. Cardiff almost stole it late on through Kenneth Zohore's speculative lob, but Burnley's lead at the top is clawed back to a point with Middlesbrough also having a game in hand. It was the Gaston Ramirez show at the Riverside tonight as Middlebrough take advantage of Burnley's draw to move within a point of the Championship leaders. Two goals and an assist, having been fouled in box for Boro's penalty, from the Uruguayan ensured all three points went to the hosts. A point is of little use to either side in this one. It was strugglers Charlton who actually finished the stronger and Ipswich's goal drought goes on. Reading are now in front against Forest and what a strike it is from Oliver Norwood! He picks the ball up 25 yards from goal and smashes the ball in off the right-hand post. There's still about 10 minutes left as it was a 20:00 BST kick-off. Derby have showboated all evening. What a performance. Bradley Johnson's double and goals from Chris Martin and Craig Bryson sealed a fine win against a Hull City side who struggled to get into the game and had their work cut out after having Moses Odubajo sent off. The whistle goes at St Andrew's and third-placed Brighton have secured a vital win to avoid loosing ground on Middlesbrough. It might be in the 93rd minute, but Craig Bryson has raced into the box to work his way on to Chris Martin's pinpoint cross and tap in. Cardiff almost steal the points at Burnley as substitute Kenneth Zohore lobs a long ball over Tom Heaton but it lands on top of the crossbar much to the Burnley goalkeeper's relief. MK Dons have had plenty of shots as they try to get back into the game against Wolves, but they've not really tested keeper Carl Ikeme since falling behind. Jay Emmanuel-Thomas and Alex Revell have been brought on up front as Karl Robinson's side attempt to find a way through. Loanee James Wilson almost seals victory for Brighton but his shot is deflected wide by Jonathan Spector. 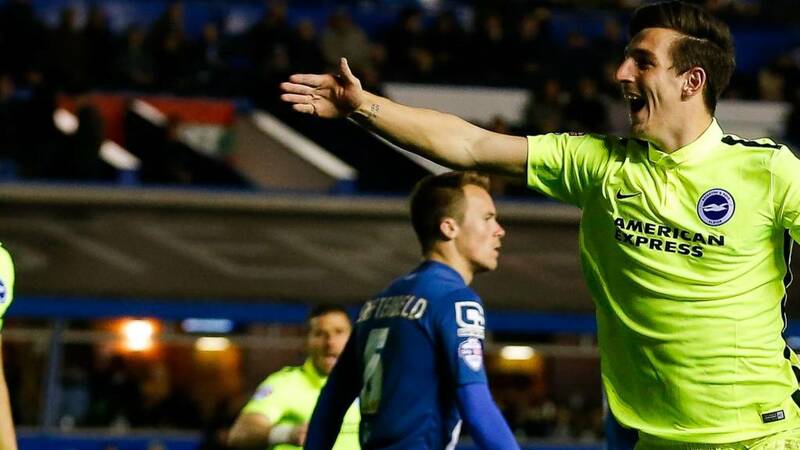 Can Birmingham punish them for that missed opportunity?